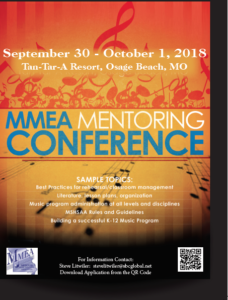 MMEA will host its 4th Annual Mentoring Conference on Sunday, September 30 – Monday, October 1, 2018at Tan-Tar-A Resort. This conference will provide valuable resources to First Year music teachers throughout Missouri. The conference will include sessions/clinics designed specifically for elementary/general music, band, choir, orchestra, K-12, and much more! Registration, resources, and meals will be provided FREE OF CHARGE for each educator. Attendees/school districts incur the expense of only one night’s lodging. **Complete the online Conference Registration Form below to secure your registration.